Wake up, round up the family, get everyone fed and out the door, hit the slopes for a full day of skiing, throw back a few brews at the apres ski spot, spend the evening wining and dining, and wake up tomorrow to do it all again… With the gruelling pace of most vacations, it’s easy to understand how you can sometimes return from holiday feeling like you need a holiday! If your body and mind are crying out for an opportunity to truly unplug and restore your energy, a yoga retreat might be just the ticket. The good news: You can combine your love of skiing and Alpine sports with a yoga holiday. Why Go On a Yoga Retreat in the Alps? Yoga has been found to be incredibly beneficial for your body and mind. The slow, deep stretching can help recover tired muscles, while more active classes help you build strength. Meanwhile, you’ll be focusing on slowing your breath and bringing your attention into the body. This mindfulness practice has been shown to reduce stress and even improve creativity. Yoga retreats are an opportunity to really dive into the diverse and enormously beneficial world of yoga. Whether you’re a devoted practitioner or brand new to yoga, there is a retreat out there for you. Unlike simply dropping into classes back home, a retreat caters to your every need — providing meals, activities, lodging, transportation, etc. — so that you can focus on you instead of the many moving parts of your holiday. The Alps prove an incredible location for a yoga retreat for several reasons, chief among them their stunning natural surroundings. If you’ve been on any ski holiday, you’ve probably experienced how nourishing these vistas can feel. Not to mention, the Alps have been adored for centuries as a health-improving destination. The clean, crisp air and natural springs are just a few of the healthful features. Yoga level: Some retreats may not be suitable for beginners, whereas other programmes might not feel challenging enough for experienced yogis. Be sure to ask what level the classes are taught at. Inclusions: Pay special attention to what’s included in your package. Sometimes flights are included (but this is not standard). Also note which activities are covered, how many meals per day are included, and whether spa treatments or excursions are included or an optional add-on. Restrictions: Many retreats offer only nutritious vegan meals and are alcohol-free. Before you swear off a booze- and meat-free holiday, consider that this is only for a few days and has been specially tailored for your well-being. Still insistent you want to wind down with a glass of wine? Read the fine print or inquire as to whether alcohol is permitted and available. Ready to book your getaway? 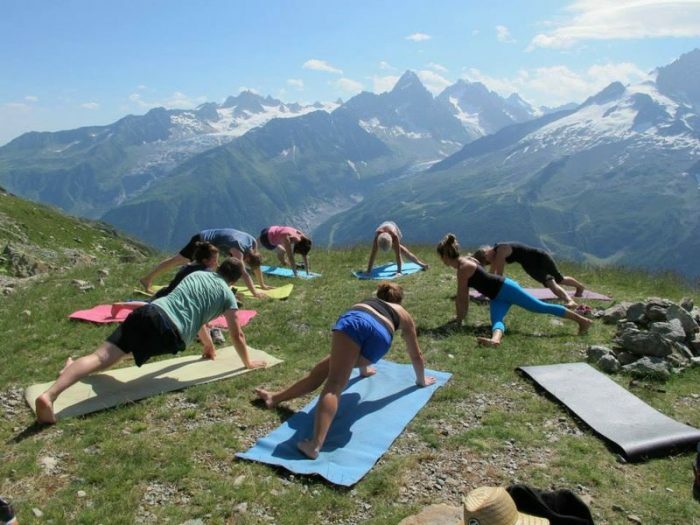 Here are a few of our favourite Alpine yoga retreats. Chalet Rosiere near La Rosiere in the French Alps is the perfect destination for a luxury, eco-friendly yoga retreat. At 1880m, the ski resort of La Rosiere is sure to have snow, and also links with La Thuile in the Aosta Valley. Chalet Rosiere offers a selection of yoga and ski holidays each year, with guest instructors, a tailored schedule of yoga and meditation classes, lift passes and ski equipment, and vegan detox meals. Alternatively, you can book a wellness retreat at any time of year, which includes a (slightly smaller) selection of yoga or pilates classes daily, spa treatments, and your choice of traditional Savoyard or vegan meals. If better health is the primary goal of your yoga holiday, book a stay with Yoga Nature Therapy in Chamonix. These highly tailored programmes include customised yoga classes, meditation, visits to the local thermal baths, sleep programmes, and an at-home plan to take with you. Retreat groups are no larger than 4 to 6 participants, guaranteeing a highly personal experience. Note: Retreats are offered March through October and do not include skiing. If you’re visiting Chamonix in the winter, though, you are not without yoga options (far from it!). In fact, Chamonix is our recommended destination if you want a “do it yourself” yoga holiday — in other words, if your travel group isn’t interested in an all-inclusive yoga retreat but you want to practise yoga. If you just want to squeeze in a few classes, try Ananda Yoga Studio, which offers classes and workshops with guest teachers. Sattva Yoga Chamonix specializes in Ayurvedic treatments in addition to yoga classes and massages. Ayurveda is the traditional Indian practice of medicine, which is often practised in conjunction with yoga classes. For a hotel stay with yoga offerings, visit Hotel Les Aiglons Resort & Spa. If you’re a yoga practitioner with a certain style of yoga in mind that you would like to practise on holiday, check out Alpen Retreat on the Tyrolean Fernpass in Austria. This retreat destination hosts a full schedule of guest instructors who lead retreats in their signature style, like Yin, Jivamukti, and Iyengar yoga. Retreats are held in a 500-year-old manor house, and include vegetarian and vegan food. You can also opt to book a custom stay with the in-house staff of yoga and meditation teachers. These retreats can include a wide variety of activities including skiing. Whichever destination you choose, take this opportunity to unplug from your chaotic everyday life and reconnect either with yourself or the loved one you’re traveling with.